Are 'Smart' Classrooms the Future? "Smart" products have infiltrated the market with the intention to make our lives easier — at home, in the workplace, everywhere. Setting aside the recognizable challenges of deploying these technologies on the enterprise scale in higher education, our team is beginning to ask, "How we can make better use of our faculty and students' time by delegating routine tasks to smart technology?" This is a particularly good question in the context of teaching and learning. What if the answer is a smart classroom? As an instructor enters the room, the classroom computer automatically logs her in; based on that individual instructor's preferences, a browser opens and loads a specific web page/location (e.g., a Canvas course site or Box folder). Rather than manually adjusting classroom lighting and audio levels or physically signing in to the classroom computer, the instructor uses spoken-word commands to complete these actions. Prior to the start of class, students waiting in the hallway receive, via their mobile devices, just-in-time information about that day's lecture (e.g., group assignments, discussion questions, etc.). 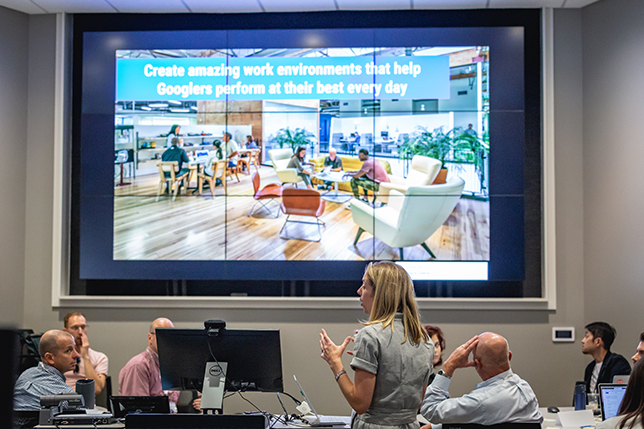 This academic year, University Information Technology Services at Indiana University convened a Smart Classroom Working Group, charged with developing a smart classroom prototype. In order to determine the top priorities to pilot, the group conducted focus groups with select faculty to better understand their process in preparing to teach a class and to identify specific functional steps in that process that would be ideal for smart self-service applications, such as the aforementioned examples. The goal of IU's Smart Classroom project is to build a learning environment that anticipates and automates common classroom tasks to make better use of faculty and student instructional time. We believe that many emerging technologies can positively affect the experience of students and faculty in our classrooms in a variety of ways, including efficiency, learning experience and comfort. The smart classroom will offer faculty and students a technology-rich space, reduce complexity and minimize support requirements. 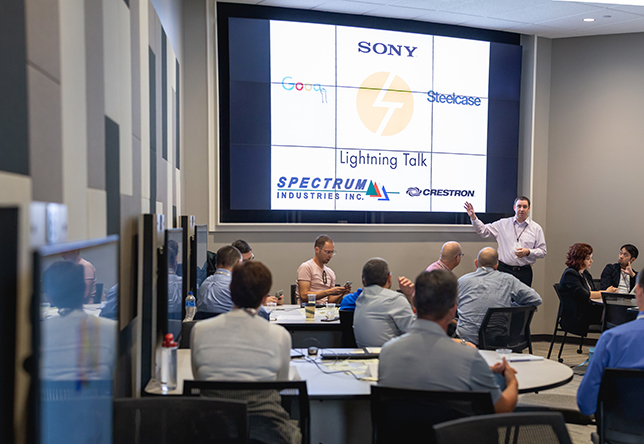 The Smart Classroom Summit convened faculty, technologists and architects along with players from Crestron, Google, Sony, Steelcase and Spectrum to generate new ideas related to current and emerging technologies. What could be developed that doesn't yet exist? This vision group conducted a compare/contrast of: a) technologies that currently exist and are yet to be deployed in the enterprise, and b) technologies that do not yet exist. Summit participants considered technologies that currently exist and are yet to be deployed in the enterprise, as well as technologies that do not yet exist. Authentication: Students and faculty save time and create efficiencies by integrating some type of recognition upon entry into the space, such as face or voice recognition, eye scan, thumb/print etc. Distance learning: The integration of augmented reality into group discussions will give students a more authentic experience for group collaboration. Environment: Walls and tables will be both analog and digital with the ability to swipe content from one to another. Automation: The smart features of the room will automate some of the laborious tasks that steal instructional time, such as taking attendance. Screenless and biometric technology will play an important role in the evolution of classrooms in higher education. We plan to research how voice activation and other Internet of Things technologies can streamline the process for faculty and students. The entire classroom will become a space for student activity and brainstorming; walls, windows, desks and all activities are easily captured to the cloud, allowing conversations to continue outside of class or at the next class meeting. Technology will be leveraged to include advance automation for a variety of tasks, so the faculty member is released from duties to focus on teaching. The technology will become invisible to the process and enhance and customize the experience for the learner. Virtual assistants could play an important role in providing students with a supported experience throughout their entire campus career. A full report on the summit findings is available here. Indiana University will leverage these findings to begin piloting new classroom features this fall. 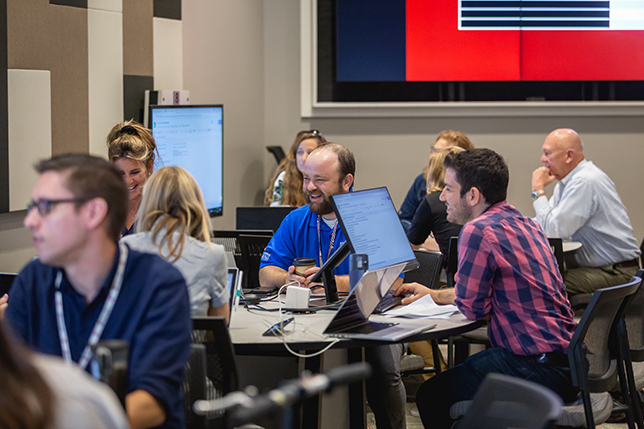 With a focus on scalability, we are aiming to create the next-generation classroom that allows instructors to spend more time teaching and impacting their students. We look forward to our future and seek to continuously evolve. These sentiments were echoed after the summit by Stacy Morrone, IU associate vice president for learning technologies: "We were excited to have our valued company partners join us for the Smart Classroom Summit to explore together how we might draw on artificial intelligence and new product offerings to improve the faculty and student experience in classrooms at Indiana University," she said. "We want to free up faculty from many of the routine tasks they need to complete during every class period to give them more time to interact with their students, starting from the moment they walk into the classroom."